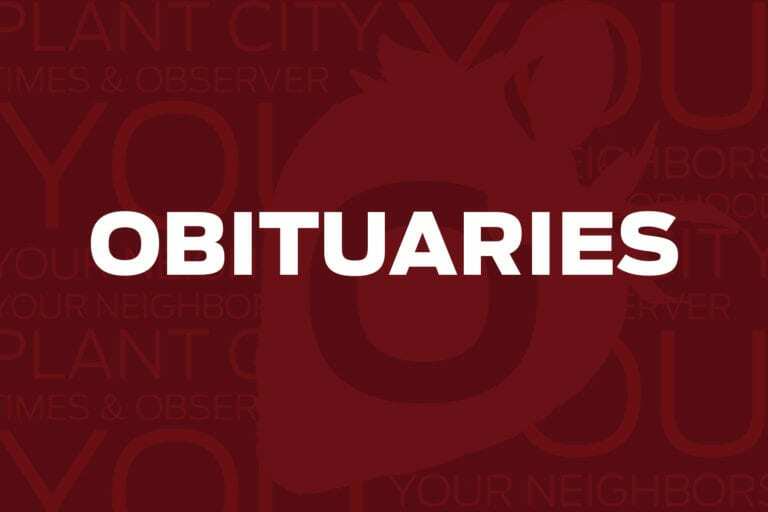 Baltazar Cruz Martinez, 22, of Plant City, passed away on Dec. 31, 2018. Margie L. Sutherland, 90, of Plant City, passed away on Tuesday, Jan.15, 2019. Funeral services will be held at 12:00 p.m. Saturday, January 26, 2019 at Wells Memorial, 1903 W. Reynolds St, Plant City, FL. Visitation will be held one hour prior at the funeral home. Burial will be held in Mount Enon Cemetery. Online condolences may be left for the family at www.wellsmemorial.com. Elayne “Elaine” Edwards, 75, of Seffner, born in Waterbury, Connecticut on June 2, 1943, entered into eternal rest on Jan. 17, 2019. William Allen Peeples Jr., 62 of Dover, passed away Jan. 15, 2019. A native of Plant City. Condolences can be made at www.haught.care. Joseph “Matt” Wright, 66, of Lakeland, born in Tampa on April 1, 1952, left to go fishin’ on Jan.19, 2019. Carolyn Joyce Orner, 57, of Riverview, born in Tampa on Oct. 29, 1961, entered into eternal rest on Jan. 19, 2019. Daniel Adrian Perez, 52, of Plant City, born July 8, 1965 in Mexico, entered into eternal rest on Jan. 19, 2019. Cynthia A. Kessinger, 52, of Plant City, passed away on Saturday, Jan. 19, 2019. A celebration of Cynthia’s life was held at 1:00 p.m., Wednesday, Jan.23, 2019 at Wells Memorial. Burial was held in Mount Enon Cemetery. Thomas ‘Gene’ Eugene Beasley Jr.
Thomas “Gene” Eugene Beasley Jr., 87, of Stephens, Georgia, passed away on Jan. 9, 2019. Thomas was born the son of the late Thomas Eugene Beasley, Sr. and Buna Sisk Beasley on Jan. 30, 1931. Thomas was a Christian and attended Clayton Church of God for thirty years. In his professional life he was an equipment operator, as well as serving his country in military service. In addition to his parents, his wife, Mary Nell Beasley; two sisters, Dorothy Beasley and Ester Beasley, and one child preceded him in death. His survivors include his children, Rick Beasley, Tim Beasley (Amy), Phillip Beasley (Melanie), Rebecca Beasley (Bobby); his siblings, Ruth Hillard (Jimmy), Bob Beasley (Wendy), Sue McNichol (Albert); three grandsons, three granddaughters; nine great-granddaughters and a number of nieces and nephews, also survive him. A memorial service will be held on Sunday Jan. 27, 2018 at the Plant City Community Church Of The Nazarene at 3:00 p.m. The church is located at 2402 Mud Lake Rd. Plant City, FL 33566. The family asks that in lieu of flowers, donations be made in Thomas’ memory to the St. Mary’s Hospice House 1660 Jennings Mill Rd. Watkinsville, GA 30667. Beck Funeral Home, in Clayton, Georgia, is in charge of the arrangements. If there are any questions, please call 706-782-9599.